curriculum is moving towards. Asking questions and allowing students to answer those questions with the curriculum content is key. Understanding the kind of question you ask and digging into the response with meaning and application – where would I use my thinking in my future life now drives the meaningful thinking of students.Essential Questions are Key to this process, the other aspect to thinking and learning as teachers work with students on learning and thinking is “How do we make it Visible?” and show the growth of this over time. 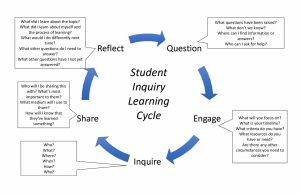 At Chaffey-Burke we are working on this by developing Essential Questions that can be used with Purposeful Postings that showcase and Highlight the Process of Thinking and where the Learning takes the discuss and product.